The 1940’s represent one of the most difficult moments for the review. The conclusion of the Second World War divides the decade in two. Before 1938 political pressures distorted and ruined the festival. With the advent of the conflict the situation degenerated to such a point that the editions of 1940, 1941 and 1942, subsequently are considered as if they did not happen because they were carried out in places far away from Lido of Venice. In addition, few countries participated and there was an absolute monopoly of institutions and directors that were members of the Rome-Berlin axis. Although this climate is more propagandistic than artistic, the festival hosted strong Italian stars like Alida Valli, Assia Noris and Fosco Giachetti. 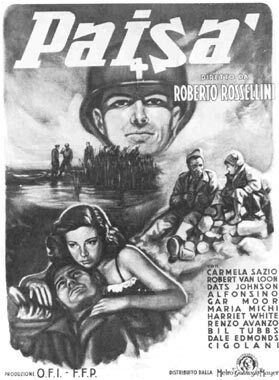 After this sad digression, the festival resumes full speed in 1946 until the end of the war, but the screenings are carried out at the San Marco cinema, because the Cinema Palace is appropriated by the Allied Powers. The new director, Elio Zorzi, wants to restore the freedom and internationalism that made the festival such a success; something that was utterly destroyed during the previous war years. For the first time, the 1946 edition is held in the month of September, in accordance to an agreement with the newly-born Cannes Film Festival, which had just held its first review in the spring of ’46. Characterizing this new journey are very important films of neo-realism, one of the most significant movements in the history of Italian film, such as Paisà (Paisan) (1946) by Roberto Rossellini, Il sole sorge ancora (Outcry) (1946) by Aldo Vergano, Caccia tragica (The Tragic Pursuit) (1947) by Giuseppe De Santis, Senza pietà (Without Pity) (1948) by Alberto Lattuada and La terra trema (The Earth Trembles) (1948) by Luchino Visconti; although their value and public success are undisputed, these works do not get the critical acclaim they so richly deserve. The festival plays host to great international directors: Orson Welles, Laurence Olivier, Fritz Lang, John Huston, Claude Autant-Lara, David Lean, Henri-Georges Clouzot, Jean Cocteau, Michael Powell and Emeric Pressburger, as well as Jean Renoir, Julien Duvivier, Marcel Carné. With the return of normalcy, Venice once again becomes a great icon of the film world, with noted stars Rita Hayworth, Joseph Cotten, Olivia de Havilland, but the true star is actress Anna Magnani from Rome, who is awarded the Volpi Cup for Best Actress for her excellent interpretation in Luigi Zampa’s film L’onorevole Angelina (Angelina, Member of Parliament) in 1947. In 1947 the festival is held at the Ducal Palace, a most magnificent backdrop for hosting a record 90 thousand participants. Surely it can be considered one of the greatest editions in the history of the festival. It sees the return to Lido of Venice of works from the USSR, which are screened side-by-side with those of "popular democracies". Czechoslovakia’s debut wins first prize thanks to the film Siréna by film-maker Karel Stekly. 1947 also sees the restoration of the International Jury to give out the International Award of the Venice Film Festival. In 1949, under the direction of the newly-appointed Antonio Petrucci, the festival returns to the Cinema Palace in Lido of Venice. The Golden Lion of San Marco for Best Film is instituted and is awarded for the first time to Manon by Henri-Georges Clouzot. This year also marks the debut of Jacques Tati with Jour de fête (Holiday).